As has been mentioned on this blog many times before, when Windows went so did FL Studio. I'd been looking for a replacement DAW for some time and quite a while ago found Bitwig Studio. 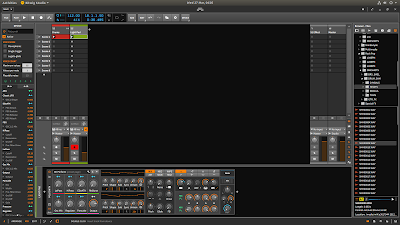 Not having a decent enough computer to run it on stopped me diving into the world of Bitwig earlier. Things are different now. Tonight I bought BWS and so far I've worked out quite a bit without reading the manual. One third of it is very similar to Ableton Live which I had used a long time ago. This is no surprise as this is where the developers came from before starting this project. The only thing I can't get to work so far is native Linux VST's but I imagine I'll work that out at some stage. BWS is now the heart of my new studio. It'll eventually run the QY sequencers and the Korg synth. I can then pipe everything into the Zoom R8 multitrack and take the files into Audacity for mastering. That's a lot of sound options. It'll take a while to get stuck into BWS especially with an update imminent. In the meantime I'll keep experimenting and creating like I've always done. AmpUT is back in business.